Hannah Burns, an 18-year-old resident of Ohio, discovered the Star Wars universe during her years in high school. One of her teachers incorporated Star Wars themes into the classroom and Burns was instantly hooked. Hannah Burns (left) and her teacher, Mrs. Krebs, at her high school graduation. Although she grew up playing with a lightsaber and a Millennium Falcon transformer toy, Burns never knew the origin of these mythical toys. She considers herself a new fan of Star Wars, but her excitement for the franchise knows no bounds. The desire to learn more about this magical galaxy far, far away started when she took an introduction to foods class in her sophomore year of high school. She was lucky enough to get placed in a class with a teacher, Mrs. Krebs, who is an ultimate Star Wars fan. Krebs incorporated elements of Star Wars into her lessons, which exposed Burns to a whole new world of fandom. "December of this past year was what sped up my interest to lightspeed. I borrowed all the previous Star Wars movies and binge watched them over Christmas break preparing myself for The Force Awakens. Until that point, I had never actually seen the movies," explains Burns. 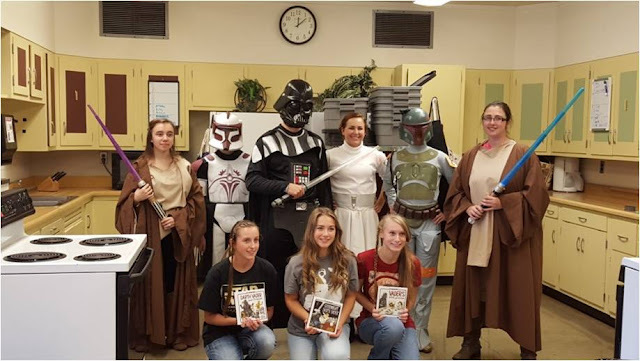 Her teacher scheduled a Star Wars Reads day after the release of Episode VII where FCCLA members were encouraged to wear costumes from the Star Wars Saga to campus. The mission of this Star Wars Reads day was to visit local kindergarten classes and share the inspiration of books with them. Burns chose to wear a Jedi costume and change into a Darth Vader getup later in the day. Her school adviser dressed as Ahsoka Tano, which Burns said was "absolutely amazing." 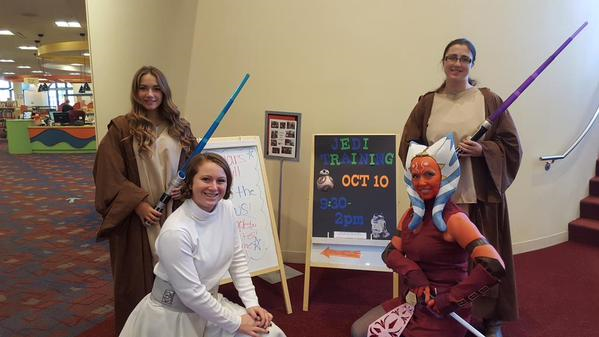 Burns (pictured back right) with FCCLA members from school at Star Wars Reads day. In her free time, she enjoys writing Star Wars fan fiction, reading blogs, and listening to podcasts. 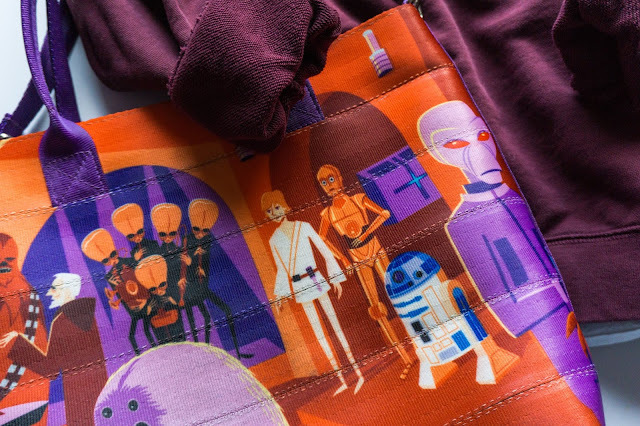 She loves to incorporate geeky details into her daily wardrobe and even found a way to show off her Star Wars side on graduation day. While she wasn't allowed to decorate her ceremonial cap, Burns proudly wore a Her Universe Rey dress underneath her gown at graduation and her teacher wore a BB-8 dress. "When I'm not doing something Star Wars related, my favorite thing to do is sit down and talk with my teacher about Star Wars," says Burns. Burns (pictured right) with friends at Star Wars Reads day. Burns has learned how to help others and serve like a Jedi, which she's been able to do through her high school clubs and organizations. Star Wars has inspired her to never be afraid of embracing her true self. "I guess to me Star Wars means love, friendship, and keeping your head up. 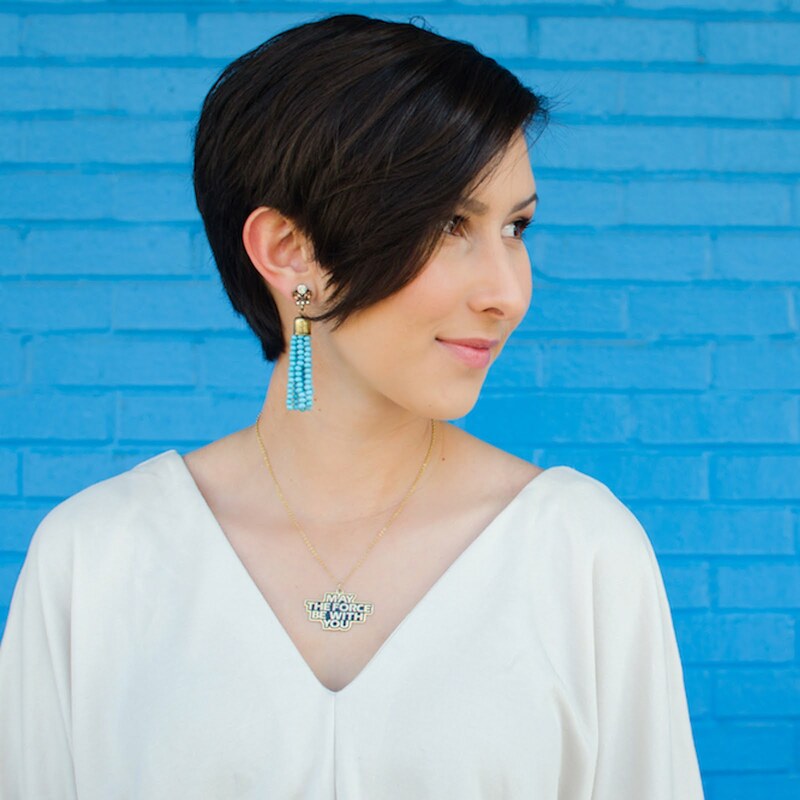 That's what Mrs. Krebs has taught me from introducing me to her fandom and watching me blossom from a youngling into a full-fledged padawan, even through all my name mispronunciations and crazy geek-outs over each new Star Wars adventure ," says Burns. You can find Hannah Burns on Twitter @DragonStone16 and Instagram @RedLeader_007. All photos used with permission and courtesy of Hannah Burns.